just behind those palm trees along the white beach area are hotels, inns, apartments, bungalows and villas. 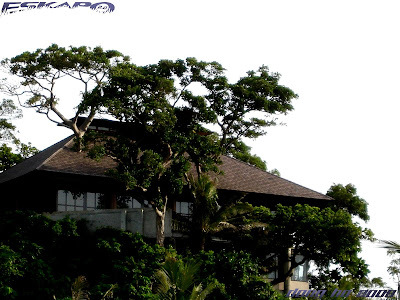 all of which accommodates the thousands of beach lovers that visits this island. 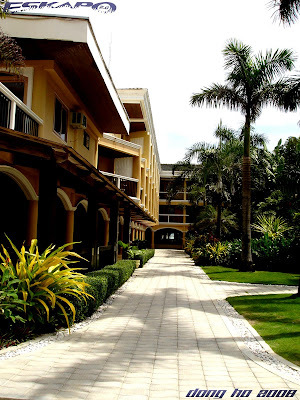 when you visit the island of Boracay, it is important that you've already chosen the hotel or resort where you'll be staying. 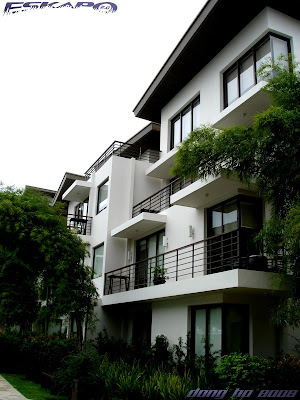 choices range from five star luxury hotels to small room rentals depending on ones need and budget. if you choose to just go there and settle on whatever is available, you can approach the information table at the Jetti Caticlan Port before taking the boat ride to the island. there are certified tourist assistants who will give you options based on your budget. it is also important that you inform them of the location that you want because you also have the option to choose the ones near the mall and other shops or out of those busy places. 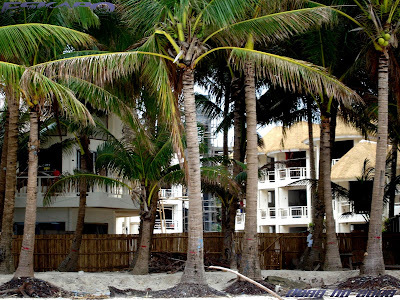 some hotels are also located on the inner portions of the beach front. usually, they are the ones that offer cheaper accommodations, but not all. 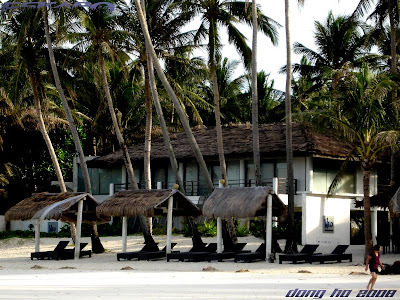 most of the first class hotels and resorts in the white beach area are located at station one while others are found along stations two and three. but whether one chooses to stay on small inns or big hotels, you can still enjoy the whole stretch of the white beach front that the island offers. no beach bunnies posed for you??? 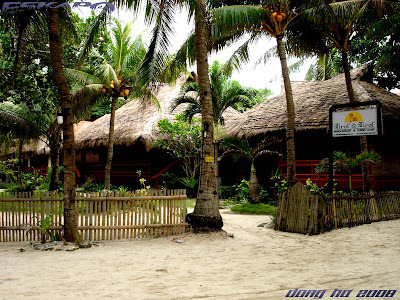 the first time i visited boracay, more than 10 years ago, it was pristine and tranquil...like you were in a location of "Lost". every year since that first visit, a new building had sprouted, the crowds got rowdier every year...it's not my ideal place to spend a vacation anymore. These pictres are really nice. One day (I hope soon) well be hosted by 'taxidiaris'! its so developed. visitors will be pleased with whatever accommodations they require, with all those choices. i wonder if you would tell us the price range for different lodgings. I agree with photo cache, it would be great if you could include the price range to those accomodations.. It's ben one of my dream to visit Bora but never get a chance yet lol.. But sana! Added your link on my list, hop you could return the favor, thanks! 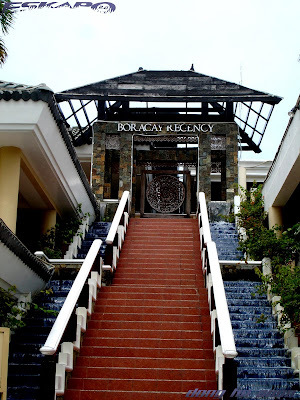 The last photo of Boracay Regency brought back fond memories. Dyan kami tumuloy last time na nadyan kami. Ok yung mga tips mo. Kasi the first time e wentthere we did not bother to book in advance kaya walang masyadong choices at medyo mahal ang rates. Good tip is to plan and book in advanced para makakuha ng lowest/best rates. Very nice for holidays... Smile for You ! I think it would be pleasant to stay in one of the small inns. I still can't get over how white the sand is. It's like sugar. ipipilit ko pa rin talaga ang sarili ko dong. kung kelangan mo talaga ng assistant willing akong i giveup work ko... hahaha! 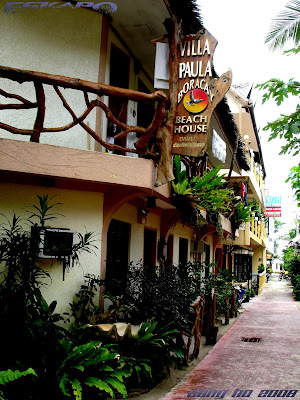 Nice overview of the options tourist have in Boracay. Which one do you recommend for a budget traveler? I fall in love with Boracay! Wish to go there one day.. Thanks for the infomation!! >hi luna, wow! i wish i've seen boracay during those times. many say that sand was even whiter. maybe you can try the other beaches in the island like puka beach or diniwid. >philip, taxidiaris are definitely welcome in our country! >photo cache, usually price ranges to as low as P800 and to as high as P15,000. ill see if i can give some options. maybe in the upcoming post. >chubskulit, ill check if ill be able to give some options. just keep in touch maybe in one of the coming posts. but usually it's in the range of P800-P15,000. i hope you'll be able to go there and try to explore other beach in the island too. thanks for adding me. adding you too. >jayashkal, isa nga yan sa mga high end. importante nga talaga ang magbook bago pumunta. marami na rin mga bagong hotels. >hi ailee, great place! thanks. >hi carver, we hope that you'll really have the chance to be in boracay. yes some small inns have reasonable prices. >wandering commuter, hehehe... sama na lang kita sa isa sa mga byahe ko. >sidney, we stayed at jerome's inn, it's cheap but the rooms are good. it's at station 2. maybe because it's newly renovated. >equi, you have a beautiful province and so lucky that boracay is part of it. >victor, you'll even like it more when you are there. I really like the way the buildings blend with the landscape rather than compete with it. I think this is part of the serenity these images convey. ayos dom. parang magkasama na rin tayo kasi nakita ko rin mga establishments na to sa bora. gusto ko yung may tubig sa hagdan ng regency kasi kakaiba. 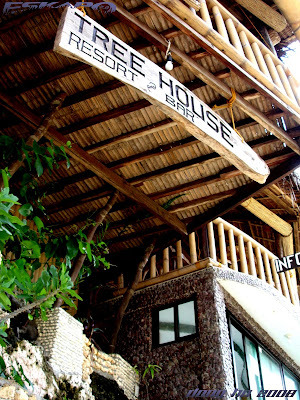 It's always a surprise every time I visit Boracay, there is always new to do and establishments are on the rise fast. Healthy competition is always good for travelers as price for accommodation tend to be unaffected by inflation. dami na pala bagong hotels and resort ah. yung bora regency talagang isa sa mga magagandang tanawin o picture souvenir place yan. iba naman ang nakakita ko ditong pag feature sa bora. >hi sandy, i agree. tropical designs are the most appropriate mode for resorts on beaches. >hi vanessa, maganda nga pagkagawa ng regency. salamat din sa pagbisita sa blog. >borneo falcon, yes. they too make the place look more beautiful. >kegler, i agree. we see more and more beautiful establishments. >abou, you have a point but most of the foreigners usually stay there for a week or more and they spend more time in their rooms just to relax, so they look for better options. >redlan, marami na nga. halos kada taon may bagong tinatayong hotel at resort. salamat sa pag abang lagi. at ang dami na palang bagong hotel. bilis din ng development ng bora ah. 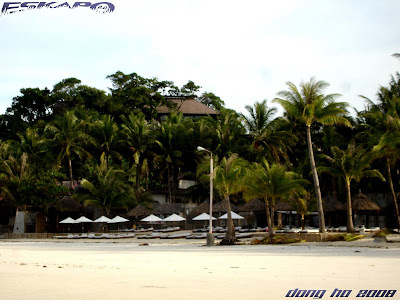 uy another sight and side of bora... panay yata bora ang tema ng mga blogs ngayon ah. hehe. kelan kaya ako magagawi sa bandang dun. pwede bang mag apply na taga timpla ng juice. .? sasamahan co lang si wandering commuter. . hehe. . sarap makieskapo. .
ganda na ng bora ulit. . parang walang nangyaring delubyo. . Very beautiful photo of the palm trees. The beach is so beautiful. You must have a great time there beside clicking the camera. Nice place to have BBQ too. Parang gusto ko na talagang pumunta ng boracay ngayon.dahil sa kuha mo. i showed hubby the place and everything and he like it too.. He wants to see if you could feature bohol in your blog hehehe..
boracay forever...did you go to the "other side" of bora? hi Dong, i have seen a lot of pictures about Bora, but this one, I have never seen this before. Is this new? >allan, yung white beach or central boracay area is a beautfiul party place but boracay still offers many other beaches on some other parts of the island. i believe that it is still a place to enjoy an island escape. >hi blue rose, dami talagang hotels and resorts doon. new hotels are continuously being built. some are being refurbished. >islander, dami ba. hehehe... party island kasi talaga ang bora. sana nga makapunta ka na rin. >hi paperdoll, hehehe... dalawa na nga kayo ni wnadering commuter kailangan ko na yatang tumayo ng kumpanya. sana nga one time ma invite ko kayong lahat. ganda talaga doon. >hi joshmarie, hehehe... sana nga. kailangan ko munang pagiipunan yan. salamat salamat sa laging pagbisita. >hi alicesg, it's a really good place to enjoy eating, strolling and almost anything. >hi merce, salamat salamat! sana nga po makapunta na kayo. dami naman ng flights ngayon papuntang caticlan. >salingpusa, very well said. sounds like you're actually there. >richard, hehehe... ang importante makapunta doon. di ba? >mavs, a really nice place to party and enjoy island life. >hi misty, thanks for sharing. im glad that he liked it. let me think about that. thanks for the idea. >tutubi, yes. i was able to visit bulabog and diniwid beach. >hi grace, some of the resorts here are new like the discovery shores and another that's still under construction. there are other hotels being constructed while some being refurbished. These are really good information, Dong. Awesome shots too for the places. I've never been there in fact I've never been to a beach resort for nearly 6 years! Malamig kasi dito kahit summer...Luuurve your pics! maraming salamat sa pagdaan dong. 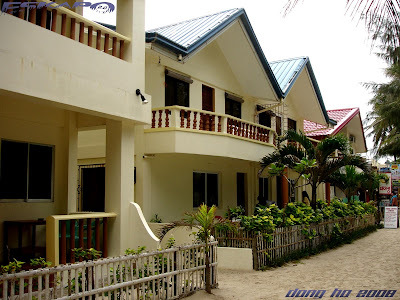 ang ganda talaga ng boracay..
pupunta din ako dyan this coming march at excited na ako.. hehehehe.. Thanks Dong. Ingat ka lagi sa Byahe. 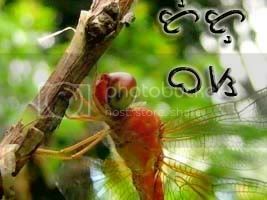 >jasper, oo nga. ganda na ng lugar sarap pa ng mga pinoy delicacies. lalo na mga seafood. >hi aisha, thanks a lot! >hi chezza, oo nga. lamig nga daw dyan kahit summer. meron din kasi akong kaibigan na nasa netherlands. siguro pag uwi mo dito makakapunta ka na talaga sa beach. >hi ms donna, wow! that's good. sino nga ba naman ang hindi maging excited. adding you on my blogroll. >carrot, wow! we are always here ready to assist you. just inform us when. >hi nanaybelen, just get in touch with me thru email. i can give you some options and a person to assist you in choosing good accomodations. i thought i have seen it all pero bakit para yatang di ko nakita yung iba ng establishment na yan hehehe. cguro dapat talaga bumalik uli ako doon. great post bro. 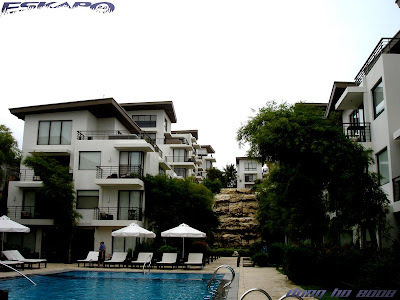 There is a great choice of accomodations and the hotels look very comfortable. Splendid sequence of pictures, Dong. 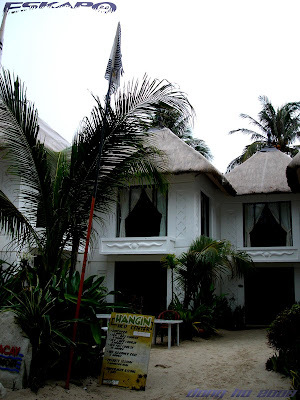 Perfect places to stay in Boracay. But I agree with Luna and Allan, I would prefer a beach in a quiet and serene setting. I'm not really a party goer. ayos to..nagkakaroon tuloy kami ng idea kung saan kami pwedeng tumuloy...salamat dong sa info..
sorry but... is this paradise!?!??? Good advice! Backpackers obviously wouldn't mind staying at cheaper places because they will still have access to the beach. 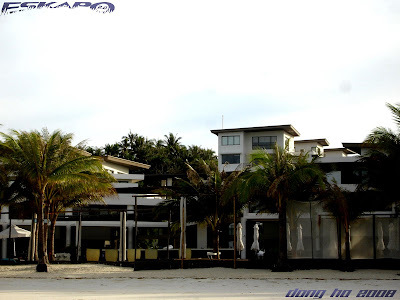 I just hope that hoteliers will try and preserve the character of Boracay. I guess that's wishful thinking. ganda ng mga resorts kuya dong. judging by how the establishments look, parang mahal yung mga accommodations. pero i'm sure komportable naman talaga yung magi-stay. some of those places to stay are really sweet looking. My friends and I had a fabulous time at Boracay a few years ago. A certified tourist assistant helped us find an ideal place to stay in and helped arranged activities for us. Wow ang sarap naman dyan sa boracay. Ang daming magaganda and ang daming seafood.. hmm yummy.. look delicious.